Thailand is once again demonstrating that its biggest economic risks come not from swings in world financial markets, but from within. Though the country should be able to cope with rising global interest rates, it needs spending and investment to sustain growth. Growing protests in Bangkok are a reminder that turmoil could derail confidence at home and abroad. Thailand is no stranger to upheaval: since Prime Minister Thaksin Shinawatra was ousted in 2006, the country has suffered periodic protests and violence. The latest round of demonstrations – the largest since the 2010 clashes that eventually killed 91 people – end two years of relative calm following the 2011 election that was won by Thaksin’s sister, Yingluck. The turbulence has resumed just as financial markets were recovering from summer jitters caused by premature expectations that the Fed would slow down its bond-buying. In the past month, the Thai baht has fallen 3 per cent against the U.S. dollar, close to the levels it touched at the beginning of September. The yield on 10-year Thai government debt is back above 4 percent. Investors are once again withdrawing funds from the country. Thailand is actually reasonably well placed to cope with a world with fewer cheap dollars. Despite the government’s expensive policy of buying rice from farmers at above-market prices, public borrowing is under control. The country does not depend on foreign investors to finance its debt, and has healthy foreign exchange reserves. Faced with weak exports, however, Thailand is counting on domestic demand to keep the economy expanding. The government avoided a sudden spending squeeze by passing its budget in early October and recently won approval to borrow more than 2 trillion baht ($62.5 billion) to fund infrastructure, including a high-speed rail network. The risk is that sustained political turmoil delays decision-making and pushes up the risk premium demanded by investors. Television images of protestors occupying the Finance Ministry could also scare off foreign tourists just as the crucial winter season gets underway. Thailand’s divisions will not be easy to bridge, but as long as they remain unresolved, periodic outbursts of political rage will continue to impose a tangible economic cost. 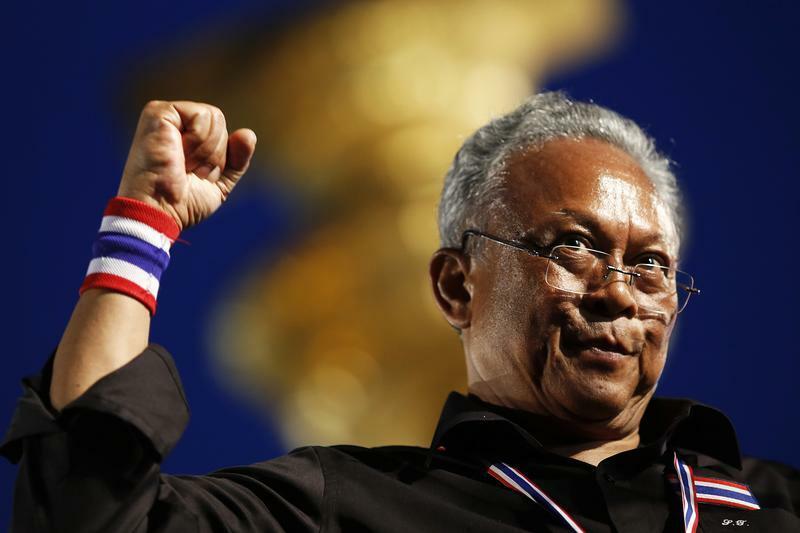 Suthep Thaugsuban, former deputy Prime Minister and protest leader, acknowledges the crowd at the Democracy monument in central Bangkok, where tens of thousands gathered in a protest against a government-backed amnesty bill, November 24, 2013. Anti-government protesters forced their way inside Thailand’s Finance Ministry and burst through the gates of the Foreign Ministry compound on Nov. 26, in an escalating bid to overthrow Prime Minister Yingluck Shinawatra. The seizing of government buildings by protesters, led by the opposition Democrat Party, plunges Thailand into its deepest political uncertainty since it was convulsed three years by the bloodiest political unrest in a generation. The protesters’ actions “threaten the stability of the government”, Yingluck said in a brief televised address. The Thai Baht traded at 31.97 against the U.S. dollar at 0400 GMT on Nov. 26. The main SETI stock market index was up 0.7 percent at 1362. Yields on benchmark 10-year government bonds were at 4.2 percent.